Bringing the Table to Tears. After living in Jackson for so long, you’d expect me to have quite a few amazing restaurants to recommend to tourists. But I have a hard time thinking of a good conclusion to the phrase: “Oh man, if you’re in Jackson you have to eat at _______.” What do you say? Sweetwater Restaurant? Snake River Grill? The Blue Lion? All very class restaurants, but are they really the blow-your-socks-off places? Myeh. Mostly. I don’t know… Chastise me all you want, but I don’t really have a favorite restaurant in the Hole, mainly because there is not a single place that is consistently amazing. I admit my judgment is flawed because so far I’ve eaten out in Chicago twice, and I haven’t been to the restaurants before, but still. No meal has ever made me blog about it before, right? Right. Early afternoon I saw Lake Michigan for the first time, which was gorgeous. So, SO many sailboats, and I was jealous of the people who partied and blasted music on the other boats. Although it seems like there’s some unwritten rule that you must be shirtless on a boat, which, in my slow, slow attempt to lose weight, I am not prepared for, haha. Also spotted two pirate flags and a man with the skull and crossbones tattooed on his chest. Vicious. With Tommy C., Tesha S.C., and Kjera S.H. in tow (although, technically, I was more of the tow) we made our way to noisy, energetic, downtown Chicago where skyscrapers towered above me and people more or less obeyed crosswalk signals. My camera died before we made our outing, but I’ll definitely snap some pictures some time later on. I have 6 weeks right? Right. Anyway, we made our way to XOCO, by Rick Bayless. Bayless is a famous Chicago chef (and winner of Top Chef Masters) whose three restaurants are the cremé-de-la-cremé of Mexican cuisine in town. XOCO is the more grassroots, Mexican street food restaurant, and we headed in there. 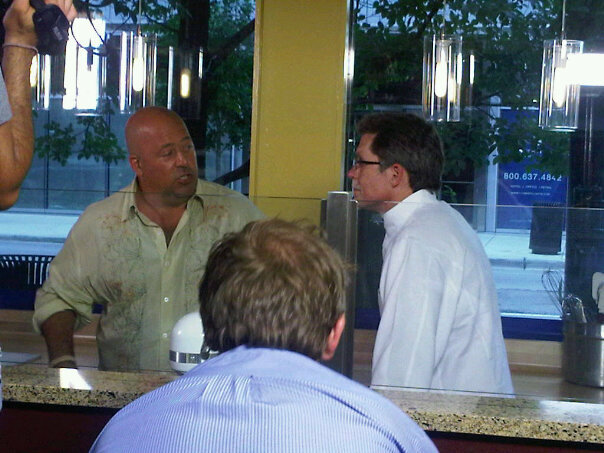 They also filmed a lot in the restaurant while we ate, so maybe you’ll see me on “Bizarre Foods: Chicago” when it airs. Who knows. Also Shia LeBouf was spotted today filming “Transformers 3”, and we walked by a spot that they seemed to be location scouting. New far-reaching goal: Become an extra in the film. Anyway. Food. 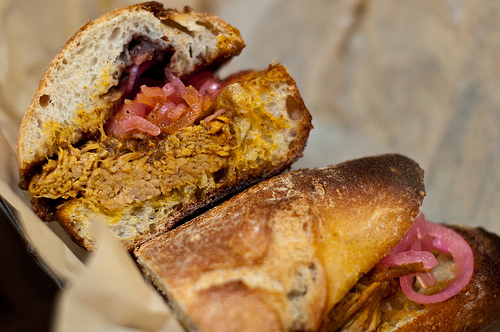 Ate the Cochinita Pibil torta and it was utterly awesome. However, the spice level was super, duper high (hola, habanero!) so as we passed our tortas around to sample each, mine ended up kicking everyone’s mouths’ asses. I personally loved the fire raging on my tongue and my lips, but it didn’t go so well for everyone and produced some tears. The pork was so deliciously seasoned and there were pickled onions on top. The sauce served with it gave it some extra Oomph, and was just delicious. Luckily the magic of the internet (and the popularity of the restaurant) offers this mouth-watering photo. Tomorrow it’s Farmers Market day in Chi-Town. Pretty stoked for some produce and samples. One more day of freedom before improv settles in on Monday. Oh. And I can barely even hear the train anymore… City life is slowly consuming me. And I love it. Hey, I live in Chicago now and was reading your blog. What part of the city do you live in? I take the red line all the time. Who are you doing the improv intensive with, second city? Enjoy the food- it’s impossible to compare it to anywhere else. I’m jealous you got to go out on the lake, I would kill for a sailboat.